← Croydon. Photo & text: David Secombe. Royal Hospital, Chelsea. Photo & text: John Londei. Posted: November 11, 2011 | Author: thelondoncolumn | Filed under: Anniversaries, Hospitals, London Types, Wartime London | Tags: 11th hour of the 11th day of the 11th month, Armistice Day, Chelsea Pensioners, lest we forget |Comments Off on Royal Hospital, Chelsea. Photo & text: John Londei. 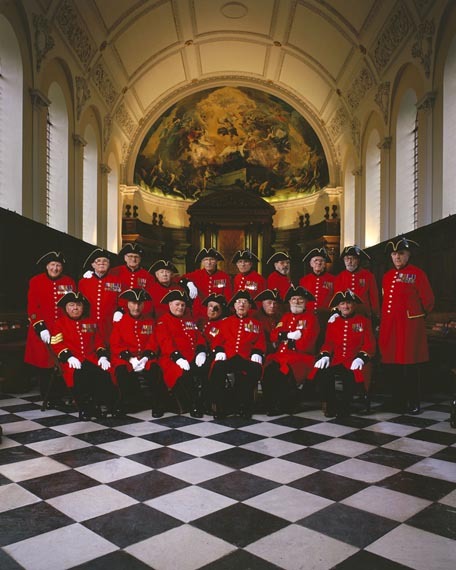 This photograph features Chelsea Pensioners – or ‘Gentlemen’ to give them their correct title – and was taken in the Chapel of the Royal Hospital Chelsea in 1998 to mark the 80th anniversary of the Armistice that, on the “eleventh hour of the eleventh day of the eleventh month”, brought the First World War to an end. Charles II founded the Royal Hospital in 1681. Sir Christopher Wren was commissioned to design and erect the building. The painting of the Resurrection on the domed ceiling of the Chapel, by the Italian artist Sebastiano Ricci, dates from 1714 and it’s believed to be a donation from Queen Anne. Back then compulsory services were held twice daily in the Chapel. Seventeen of the Gentlemen in the shot were jokingly called ‘The Spice Boys’ because they always volunteered for such events. Nine days earlier they’d taken part in the Lord Mayor of London’s annual parade appearing on a float depicting The Royal Hospital’s history. But for me the real ‘star’ of this photo was Albert Alexandre, the last veteran of the First World War still resident at the Royal Hospital [the centre row of floor squares point directly to him sitting in the 1st row]. Albert was born in Jersey. Both his parents died when he was six, and he went to live in an orphanage. In 1917 Albert, who looked older than his years, lied about his age (he was 15) and enlisted in the Guernsey Light Infantry. He saw action at Passchendaele, outstanding among the battles of the war not only for its cost in life and limb (almost half a million allied casualties), but also for the weather. In the heaviest rain for 30 years, men, horses and pack mules drowned in the deep shell holes caused by constant bombardment. He witnessed men being blown to pieces all around him, and took part in hand-to-hand fighting. A phrase from one of Siegfried Sassoon’s poems sums it up: ”I died in hell – They called it Passchendaele”. Albert was discharged in 1919, but re-enlisted into the Royal Garrison Artillery serving in India during World War Two. When Alfred’s wife died in 1992 he moved to the Royal Hospital where he remained until his death in January 2002 aged 100.